ROSEMÈRE, October 2, 2018 – The Town of Rosemère earned gold at the award ceremony capping the 2018 edition of the Communities in Bloom, National and International competition. 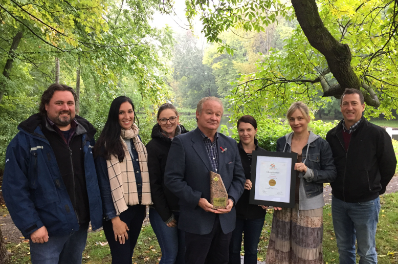 Indeed, it earned the 5 Blooms – Gold award of excellence as well as a special mention for its Urban Forest at the ceremony held in Edmonton, Alberta on September 29. The Town of Rosemère was entered in the International Challenge (large) category competing with the towns of Beaumont (Alberta, Canada), Brooks (Alberta, Canada),Llandudno in Bloom (Wales, UK), Nieuwpoort (Belgium) and Szentes (Csongrad, Hungary). The evaluation leading to this award was carried out during the summer by volunteer judges who looked at all of the community’s sectors of activity — commercial, institutional, and residential, including volunteer action — and took into account the following criteria — tidiness, environmental action, heritage conservation, urban forestry, landscape, and floral displays. “The community certainly has a number of assets that define it as a green oasis in the Greater Montreal region, but no aspect resonates as much, nor contributes more to it than its forest cover, which reflects the diversity, health and quality of its urban forest. Rosemère appears to be Québec’s ‘Tree City’, and possibly more!” wrote volunteer judges Gérald Lajeunesse and Mauro Paradisi following their visit to Rosemère.